Other than redoing my compositions with Vuo 1.0? Nope. 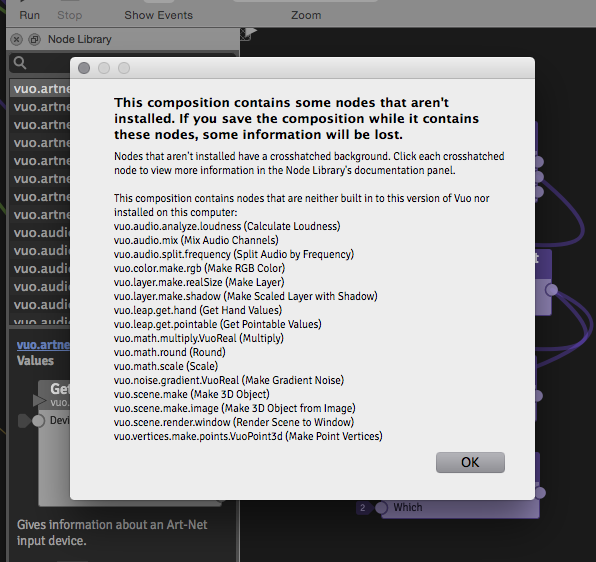 It's asking for nodes that are obviously there because there being used in compositions that I create in Vuo 1.0. Could you attach a composition that fails to open in Vuo 1.0.0? If you open the composition in Vuo 0.9.0, then save it, then open it in Vuo 1.0.0, does it work? OK, cool; glad it's working now. I'll see if we can make that message more informative. Fixed in Vuo 1.0.1. The dialog that pops up when you try to open a pre-0.9 composition in 1.0 now explains what to do; you no longer have to click on a node to see those instructions.